Today, Sunday, is a dampy rainy kind of a day. The sort of a day that makes me want to pull the duvet back over my head and pretend it never started. Today calls for comfort food. 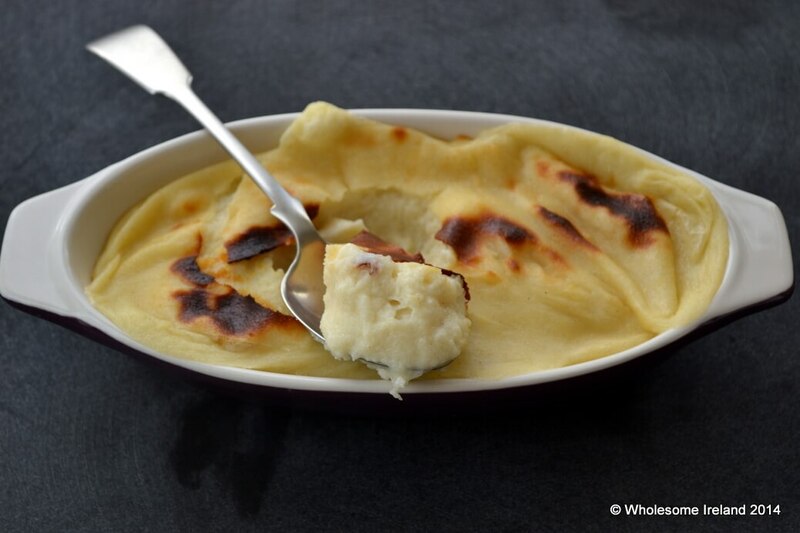 This is a traditional, old style, stick-to-your-ribs semolina pudding, it’s frugal and easy to make with just 3 core ingredients. You’ll find semolina flour in the tinned fruit section of Irish supermarkets. It’s expensive enough but you won’t need very much to make this dessert. OR you can copy me and stock up on large bags of fine semolina flour in the Asian Supermarket and lug it home on the train. It’s worth it. I got 1.5kg last week for €3.49. This is going to last me for ages. I use semolina as a crumb coating for the likes of chicken nuggets and it’s essential in pizza making. Then there is this semolina pudding. which conjures up great childhood memories of eating big comforting spoons and working the spoon around the dish so that you got a bit of sweet jam at the very last minute. Heat the milk gently in a large saucepan on a medium heat until it’s just beyond body temperature. This will speed up the cooking process. Pour the semolina into the milk and using a metal whisk gently stir the milk and semolina continuously. Keep the saucepan over the heat but turn it down slightly. Keep on stirring until the semolina pudding thickens and begins to bubble. It should take approximately 7 minutes or so. Stir in the sugar and then the vanilla extract. You can immediately serve this pudding OR you can pour the contents of the saucepan into a greased heavy baking dish. Then bake the pudding in the oven for 20 minutes at 200 degrees Celsius (fan oven). This creates the magic, caramelised skin on top which is prized in our family. Serve with a dollop of jam and if you’re feeling really decadent, a gentle spoonful of clotted cream. Can you tell me how much semolina you would use for making pizza dough & what it dies to the dough in terms of texture please? I usually substitute 20% of my pizza flour for fine semolina. Makes a lovely base. Hi Aoibhinn I don’t use it *in” the pizza dough. I use semolina underneath the pizza dough when shaping & baking on either a stone or a flipped over baking tray. Basically it works like you’ve put mini ball bearings underneath the pizza and adds a crispness to the bottom crust. isn’t an irish pint 568ml? using just 450ml could be very little for this recipe? Hi Irmhild I’ve cross checked the size of the carton I used and it was in fact 500ml of milk. I’ll amend the recipe to reflect this. Thank you for cross checking. Thanks for changing it, American and imperial measurements are such a minefield when cooking and baking, especially with recipes online! I’ve learned the hard way to triple check everything and to try and figure out if the recipe was written in America or Europe, …and to reduce the sugar amount in any American recipe straight away 😉 ! 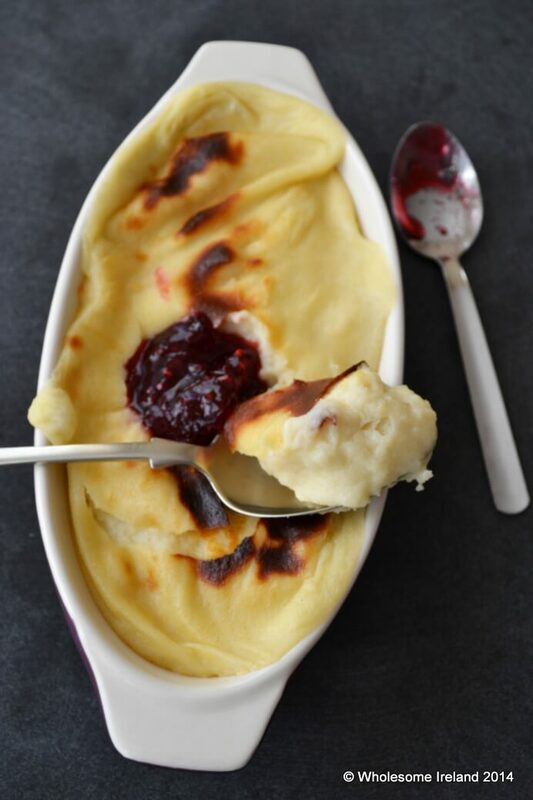 …Love semolina pudding, one of the things my granny liked to make for us. She used to stir in an egg yolk, ‘for extra nourishment’! Asian supermarkets are great! Some things that are considered a special treat in Irish supermarkets, are a staple in the Asian (and some mediterranean ones) and you get good bulk buy value, too. Exactly. I’m a huge fan! Yes so did we. We’d stir in a yolk or two and use the whites for meringues! Funny – my mum used to sometimes whisk egg whites and fold them under for extra fluffiness. 🙂 I used only 75 g of semolina on 500 ml of milk and it still set. Looks like the German version of semolina pudding is just a bit lighter. 150 g of Semolina for 500ml of milk is too much. It’s very thick, you can’t even stir it! I have to try again with less semolina! would this work with non dairy milk? I’m afraid I’ve not tried it with non dairy milk but there’s no reason why you can’t try it for yourself. This came out like mashed potato and so heavy. It was inedible and had to throw it away. I found reducing the semolina to 50g was fine – more like what I was used to from when I was little and a tad less sugar, but that’s a matter of taste. 2 oz of semolina to 1 imperial pint of milk and 1 oz sugar. Brilliant tips to get the consistency you like. Thank you for sharing. there is thick, thick and thick and 500mls is a nonsense. It won’t even stir in the pan. have just added 500mls more. It really is a case of using as much milk as you’re happy with. This recipe is made to my preferences but you should make it to yours!